Author’s note: The following text is my translation of a portion of Mahabharata called Shanti Parva. 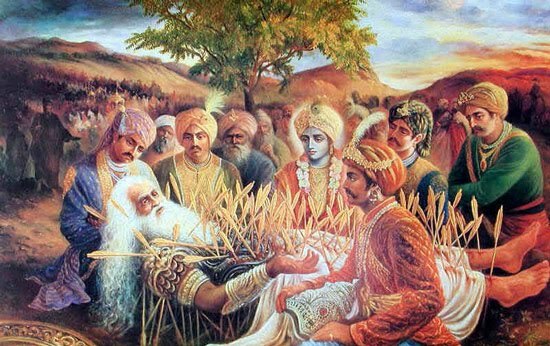 After grandsire of Kauravas and Pandavas – Bhishma – was put on bed of arrows piercing through his body by Arjuna at the behest of Krishna. Krishna then instructs Yudhisthira to approach the grandsire at the end of each day when war is halted. Shanti Parva – literally translated Chapter of Peace ­– documents the discussion between Yudhisthira and Bhishma. Having lived celibate – without a companion or wife – for hundreds of years he mentored kings by renouncing his own right to the throne. He was by all means a selfless and dutiful hermit who was forced to fight on the sides of Kauravas owing to his loyalty to the throne. In the following lines are translation of his views on Brahmacharya and Yoga. Among all living creatures man is said to be the foremost. Among men, those who are Dwija (twice born) are called foremost; and among those Dwijas those who are conversant in the Vedas are revered. Dwijas are also those who have become conversant with Brahma – the ultimate truth. Just like a blind man, without a guide, encounters several troubles along the path, a person bereft of knowledge too encounters many obstacles. This is the reason why people with knowledge are revered. Those who seek virtues practice diverse types of rites & rituals prescribed in the scriptures. Yet, they aren’t liberated or find that infinite bliss. Virtuous qualities, namely: Purity of speech, of body and of mind, forgiveness, truth, steadiness and intelligence – are displayed in people who follow Brahmacharya – the path of attaining Brahma ­–the ultimate truth. Brahmacharya is exceedingly difficult to practice. Brahmacharya is when a person is deprived of all bonding with the five vital breaths, mind, understanding, the five sense of perception and five sense of action. He who practices it duly attains Brahma; he who practices it half and half, attains to the condition of gods; while he who practices it indifferently takes birth among Brahmana and possessed of learning attains eminence. The person must subdue quality of Passion as it begins to manifest itself or as soon as it begins to be powerful. Once taken the vow of Brahmacharya the person must see all woman equally – as his mother. He must never cast his eyes on an undressed woman. If a sight of women, under indifferent circumstances, fills a weak-minded person with passion then that person mustn’t even talk to a woman. While observing the vow of Brahmacharya should a person feel desire for a woman he should as expiation observe the some severe austere rituals. Brahmachari – practitioner of Brahmacharya – must know always that by being attached to objects people are always fraught with evil and become helpless. The wise men who are unattached to objects attain ultimate happiness – Paramananda. The person desirous of carrying the vow of Brahmacharya – i.e. Brahmachari – must be pure in speech, thought and body. He must also be free of ego. By having a tranquil soul and knowledge he must pursue happiness without attachments to people or objects. When attachment arises in his heart he can be free of it by practicing indifference. He, by always remembering, that whatever his acts, good or sinful, the doer always tastes its consequences, must in speech, thought and deed, do only acts that are good. By practicing non-violence, truthfulness, honesty and forgiveness one can obtain happiness. By exercising one’s intelligence and by realizing peace one can firmly control his mind. Brahmachari should never even think of doing evil to others or covet what is others’. He should not turn one’s thoughts towards objects that are non-existent. They should, instead, direct one’s mind towards knowledge. One must free himself of malice or censure. Possessed of a sound heart a Brahmachari mustn’t utter words of dishonesty. Their words should neither be harsh nor cruel. The universe is bound in speech. The person who commits an act under impulsion of passion obtains much misery in this world and eventually sinks into hell. It is, therefore, important that one practices self-restraint in body, speech and mind. Just as robbers throw away their spoil when they are concerned about their own safety, even so should a person cast off all acts dictated by Passion & Darkness if he seeks wisdom. Let there be no doubt that a person without desire, free from the bonds of the world, contended to live in solitude, abstemious in diet, devoted to penances and with senses under control, let him burn all his sorrows by the acquisition of knowledge, that takes a pleasure in practicing all particulars of Yoga discipline, and who has a cleansed soul, succeeds, in consequence of his mind being withdrawn into itself, in attaining to Brahma. Those endued with patience can control one’s understanding. With the understanding thus disciplined one should then control one’s mind and then with the mind overpower the objects of the senses. Mind, thus brought under control, and senses being all subdued, the senses will become luminous and gladly attain Brahma. When one’s senses are withdrawn into the mind, the Brahma becomes manifested in it. So, when the senses are destroyed, and the Atman returns to the attribute of pure existence, it comes to be regarded as transformed into Brahma. Then again, one should always exert to restrain one’s senses by practicing the rules of Yoga. One engaged in the practice of Yoga must do all those acts by which one’s conduct and disposition may become pure. For practicing one’s yogic powers the means of one’s subsistence one should rather live upon broken grains of corn, ripe beans, dry cakes of seeds from which the oil has been pressed out, potherbs, half-ripe barley, flour of fried pulses, fruits and roots obtained in alms. Once a vow of Brahmacharya is taken it mustn’t be suspended. The vow must be followed by accumulation of knowledge. By accumulation of knowledge Brahma gradually shines on the person following the vow like the sun. Ignorance, which has knowledge for its resting ground, extends its influence over all the three states, namely: waking, dreaming and the dreamless. Followed by understanding, the knowledge assails such ignorance. The evil-hearted person fails to obtain knowledge of the soul since he considers it to be united with the three states, although in reality it transcends them all. But when he realizes that soul isn’t in unity with such states he becomes divested of attachment, thereby shunning his evil, and attains liberation. When such a liberation is attained one transcends the effects of age, rises superior to the consequences of decrepitude and death, and obtains Brahma which is eternal, deathless, immutable and deteriorating. The Yogi who wishes to practice relentless Brahmacharya but impressed with the faults attaching to dreams should, with his whole heart, seek to abandon sleep. In dreams, the embodied soul, affected by the attributes of Passion and Darkness, seems to become possessed of another body and move as well as act influenced by desire(s). By being in relentless pursuit of knowledge, reflection and recapitulation, the Yogi can remain eternally awake. The learned Rishis say that it is in consequence of the senses being worn out of fatigue that dreams are experienced by all creatures. This is because although the senses are suspended the mind never disappears or becomes inactive thereby giving rise to dreams. A person with desire and attachment obtains those imaginings in dreams based upon the impressions of countless lives in the past. Nothing that impresses the mind is ever lost, and the Atma being cognisant of all those impressions causes them to come forth from obscurity. Among the three acts of Satwa (Goodness), Rajas (Passion) and Tamas (Darkness) is brought about by the influence of past acts and by whichever amongst them the mind is affected for the time being in whatever way, the elements in their subtle forms display or indicate accordingly in the way of images. After images, thus produced, the particular attribute of Goodness, Passion or Darkness that may have been brought by past act rises in the mind and conduces to its last result, viz. happiness or misery. Whatever objects a person perceives in the mind while wakeful through the senses in a state of perspicuity are apprehended by the mind in dreams while the senses are obscured in respect of their functions. Owing to nature of Atman mind exists unobstructed in all beings. This is due to the nature of the Atman. The Atman should be comprehended. All the elements and the objects they compose exists in the Atman. In the Sushupti or dreamless slumber the human body disappears in the mind. Occupying the body the mind then enters the Atman becomes transformed into wakeful witness. By dwelling in pure consciousness, it is regarded by the Rishis, that Atman transcends both consciousness and all things in the universe. The Yogi who in consequence of his desire covets any of the divine attributes, of Knowledge or Renunciation, should regard a pure mind to be identical with object of his desire. All things rest in a pure mind or soul. This is the result attained by one who is engaged in penances. That yogi, who has overcome Darkness & ignorance, becomes possessed of transcending effulgence. When darkness or ignorance has been transcended the Atman becomes Supreme Brahma, the cause of the universe. Brahma which is said to have Knowledge only for its attribute is difficult of attainment. Goodness is the attribute of the Devas while Darkness belong to the Asuras. Brahma transcends all those attributes. It is pure Knowledge. It is Deathlessness. It is pure effulgence. It is not deteriorating. Those people of cleansed Atmans who know Brahma attain to the highest end. One having knowledge of one’s eyes can say this much with the aid of reason and analogy. Brahma which is indestructible can be comprehended by only withdrawing the senses and mind from external objects into the Atman itself. He cannot be said to have known Brahma who does not know the four, namely: Dreams, Dreamless Slumber, Brahma as indicated by qualities and Brahma as transcending all qualities. He must also know the Manifest and Unmanifest as the great Rishi Narayana has described as Tattwam. That which is manifest is liable to death. That which is unmanifest should be known as transcending death. The Rishi Narayana has described the foundations of Pravritti upon which rests the whole universe with its mobile and immobile creatures. The dharma of Nivritti leads to unmanifest and eternal Brahma. Pravritti implies rebirth or return. Nivritti on the other hand implies the highest end. The Brahmachari who desires to discriminate with exactitude between good and evil, who is always bent on understanding the nature of the Atman and who devotes himself to Nivritti, attains to that high end. The ascetic who desires to discriminate with exactitude between good and evil, who is always bent on understanding the nature of the Atman and who devotes himself to Nivritti attains to that high end. One desirous of accomplishing this, should know both the Unmanifest and Purusha of which I shall speak presently. Both Prakriti and Purusha are without beginning and end. Both are capable of being known by their like. Both are eternal and indestructible. Both are greater than the greatest. In these they are similar. They are points of dissimilarity again between them. Prakriti is fraught with the three attributes of Satwa (Goodness), Rajas (Passion) and Tamas (Darkness). It is also engaged in creation. The true attributes of Kshetrajna (Purusha or the Atman) should be known to be different. Purusha is the apprehender of all the transformations of Prakriti – but cannot apprehend himself. Purusha transcends all attributes. As regards Purusha and the Paramatman both of them are incomprehensible. In consequence again both of them being without attributes by which they can be distinguished, both are highly distinguished from all else. A turbaned person has his head circled with three folds of a piece of cloth. The person, however, is not identical with the turban he wears. After the same manner the embodied Atman is invested with three attributes of Satva, Rajah and Tamo. But thus invested the Atman is not identical with those attributes. Hence these four topics should be understood by a Brahmachari. One who understands all this is never confused when one has to draw conclusions. He who is desirous of attaining high prosperity should become pure in mind and by taking himself to austere practices in respect of the body and the senses, should devote himself to yoga without desire of fruits. The universe is pervaded by yogic power secretly circulating through every part of it and illuminating it brightly. The sun and the moon shine with effulgence in the firmament of the heart in consequence of yogic power. The result of Yoga is knowledge. Yoga is, and will be, talked very highly in the world. Whatever acts are destructive of Rajas and Tamas constitute Yoga in respect of its real character. Brahmacharya and abstention from violence are said to constitute Yoga of the body; while restraining mind and speech properly are said to constitute Yoga of the mind. The food that is obtained in alms from regenerate persons conversant with the ritual is distinguished from all other food. By taking that food abstemiously, one’s sin born of Rajas begin to fade. A yogi subsisting upon such food finds his senses gradually withdrawn from their objects. Hence, he should take only that measure of food which is strictly necessary for the support of his body. The embodied, when divested of Rajas, assumes a subtle form with all the senses of perception and moves about in space. When his mind becomes unaffected by acts, he, in consequence of such renunciation (loses that subtle form and) becomes merged in Prakriti without yet attaining Brahma or liberation which transcends Prakriti. After destruction of this gross body, one who through absence of heedlessness escape from all the three bodies (viz., the gross, the subtle and the Karana) succeeds in attaining liberation. The birth and death of creatures always depend upon the cause constituted by Avidya (roughly translated: ignorance). When knowledge of Brahma arises, necessity no longer pursues the person. Those, however, who accept what is reverse of truth are men whose understandings are always taken up with the birth and death of all existent things. Such people can’t even dream of Moksha. Supporting their bodies by aid of patience, withdrawing their hearts from all external objects by the aid of their understanding, and withdrawing themselves from the world of senses, some Yogis adore the sense in consequence of their subtility. Some among them, with mind cleansed by yoga, proceeding according to the stages indicated in the scriptures and reaching the highest, succeed in knowing it by the aid of the understanding and dwell in that which is the highest and which without resting on any other thing rests on itself. Some worship Brahma in images, some worship him as existing with attributes, some repeatedly realize the highest Divinity which has been described to be like a flash of lightning and which is again indestructible. Others who have burnt their sins by penances, attain to Brahma in the end. All those Brahmacharis attain to the highest end. The Brahmacharis who have transcended the necessity of depending on the body, who have cast of all attachments and whose mind is devoted to Yoga should be known as another instance of infinity or as he who is unmanifest. They whose hearts are devoted to the acquisition of knowledge succeed first in freeing themselves from the world of mortal. Subsequently, by casting off attachments they partake of the nature of Brahma and at last attain Brahma. According to the Rishis they who follow their Dharma according to the measure of their knowledge all succeed in obtaining the highest end. Those persons of pure hearts who have imbibed contentment from knowledge, and who have castoff all desires and attachments, gradually approach in respect of their nature, nearer and nearer to Brahman which has the unmanifest for his attribute, which is divine and without birth and death. Realizing the truth that Brahma dwells in them, they become themselves immutable and have never to return to the destructive world. Attaining to that supreme state which is indestructible and eternal, they exist in felicity. The whole universe, bound up in desire, is revolving like a wheel. As fibres of a lotus-stalk overspread themselves into every part of the stalk, in the same manner the fibres of desires which have neither beginning nor end, spread themselves over every part of the body. As a weaver drives his threads into a cloth by means of his shuttle, in the same manner the threads that constitute the fabric of the universe are woven by the shuttle of Desire. A Brahmachari who properly knows transformations of Prakriti and Purusha becomes freed from Desires and attains Moksha – the ultimate liberation. Excellent work! Great translation. Bheeshma pitamaha was a treasure of knowledge and he gave us many gems. Thanks for posting this and making it available to all of us.